On Common Ground featured Christian author, Rev. Brian McLaren, leader in the Convergence Network and Auburn Senior Fellow; Prof. Obery Hendricks, one of America’s foremost commentators on religion and politics and Visiting Scholar in Religion and African Studies at Columbia University; Prof. Hussein Rashid, who teaches at Barnard and New School and whose research focuses on Muslims and American popular culture with a special interest in Shi’i justice theology; and Rabbi Rachel Kahn-Troster, Deputy Director of T’ruah: the Rabbinic Call for Human Rights and noted rabbi, speaker, and writer on Judaism and human rights. Among the topics discussed were: our common humanity, the difference between imposing solutions versus solutions that grow from the bottom up, how invisible the suffering of our neighbors can be, recognizing the expertise of the human beings whose human rights are at stake, the significance of time such as the short time it took to transform conditions and the way it is all too easy to consume without pausing or thinking, and, of course, CIW’s algorithm: consciousness + commitment = change. Panelists at Common Grounds are pictured, from left to right: Rev. 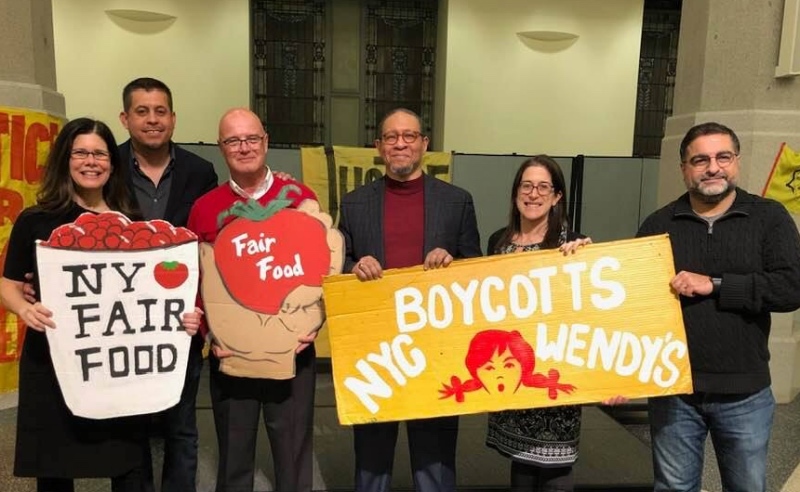 Noelle Damico, Gerardo Reyes of the CIW, Rev. 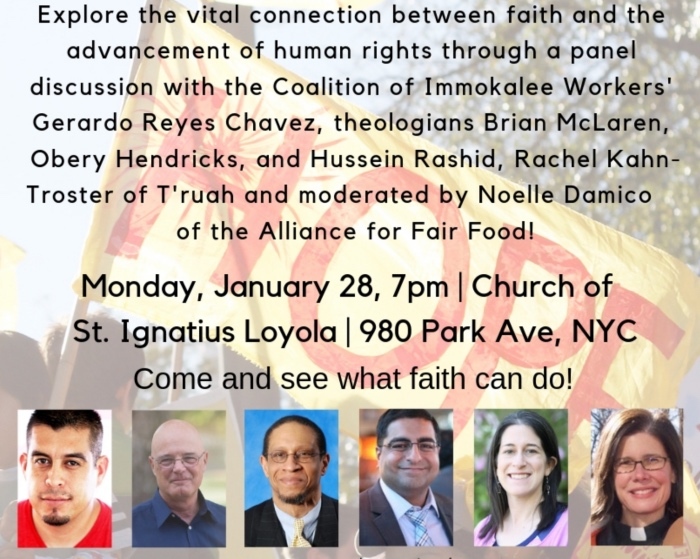 Brian McLaren, Prof. Obrey Hendricks, Rabbi Rachel Kahn-Troster, and Prof. Hussein Rashid. The evening began with a warm welcome on a frigid winter night from Teresa Marie Carino, Pastoral Assistant at St. Ignatius and member of the National Advisory Council of the Ignatian Solidarity Network, who reminded all gathered that St. Ignatius welcomed CIW leaders to their congregation during their momentous Freedom Fast last March outside of Trian Partners and that the congregation was honored to continue to walk together in the quest to expand the gains of the Fair Food Program by bringing Wendy’s onboard. And then the conversation took off for almost an hour. Here are some excerpts from the discussion. “It is a holy thing to protect people’s dignity; so that their children have real laughter, unencumbered…” reflected Obery. On healing and forgiveness – not doing it again! We are grateful to all of our keynote panelists, to the Church of St. Ignatius Loyola, and to everyone who joined us for this inspiring evening!